The book provides a solid and unitary mathematical foundation of the basic and advanced principles of aerodynamics. The densities of the fundamental solutions are determined from singular integral equations. The fundamental solutions method in aerodynamics was considered for the first time and used by the author in over 30 papers published in prestigious journals (e.g. QAM, AIAA, ZAMM, etc) in order to develop a unitary theory. The boundary element method is used for numerical approximations in compressible aerodynamics. The text incorporates several original contributions, among other traditional mathematical methods. The book also represents a comprehensive presentation of research results since the seminal books on aerodynamics of Ashley and Landahl (1965) and Katz & Plotkin (1991). A rigorous mathematical approach is used to present and explain classic and modern results in this field of science. The author has therefore conceived several appendices on the Distribution Theory, the singular Integral Equations Theory, the Finite Part, Gauss Quadrature Formulae, etc. The book is concluded by a relevant bibliographical list which is especially useful for researchers. The book is aimed primarily at applied mathematicians, aeronautical engineers and space science researchers. 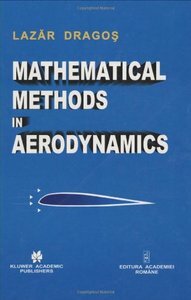 The text may be used also as a comprehensive introduction to the mathematical foundations fo aerodynamics, by graduate students in engineering and fluid dynamics with a strong mathematical background.